Some of you may have read “The Reason I Jump”, which was Naoki Higashida’s account of Autism from inside. The book is on our recommended book list. He wrote this when he was thirteen, back in 2007. Ten years on, he is now giving us further insight into Autism as a young adult. 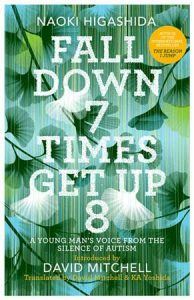 It is described as a young man’s voice from the silence of Autism and there are eight chapters which have been translated from Japanese by David Mitchell, who translated “The Reason I Jump”. Autism + Environment = Outcome. The title is borrowed from a Japanese proverb about the merits of persistence and the book is described as offering experience and advice and hope. We shall be bringing the book to our Post-Diagnostic Support group and I would welcome, if anyone feels able to, read the book and review it for us.